So first came the news that Steve Jobs had died. I learned much about him during the next few days' worth of all-Steve coverage on the various news sources. Then there was Anne McCaffery. I had seen her a couple of years at Dragon*Con and have enjoyed her world of dragons (and occasionally science fiction, especially "The Crystal Singer") since I was 16. Now I just learned that the director Ken Russell has died. Wow. There's three. These things always seem to come in threes. Three creative geniuses who all influenced my life and creativity in many different ways. Steve, of course, because of his Apple. I learned how to use an AppleII back in the 1980's, when its design and layout was seen for what it was, and companies were still using a variety of different computers according to their needs. By the early 1990's, of course, all that had changed. But you could design a folded hand-out on an early Apple, you got to see how much time was going to elapse before the computer would respond to your commands, and you could adjust the tabs and margins by looking at them and moving them to the places you wanted to. On a PC? Man, you were in trouble, and you had better learn how to do it while tap-dancing around your boss. On a Mac? Simple and easy peasy. Now, of course, I have an iMac and a Nanopod and both have changed the way I do things. I used to record albums on cassette tapes and just listen over and over, in kind of a zone, to the album, letting my thoughts go where they may. Now, though, when I work out (and I will again soon! ), I just stick my Nanopod with its little clippy-thingie on my shorts and who knows what song will come up? Will I listen to some mellow stadium music or will it be a Celtic piece? Will my running pace keep up with a drum machine or will I slow down to a ballad? I still listen to music on a stereo or in a car in the one-song-follows-another format, but now I have an alternative. And I was able to create a CD of sailing songs for my aunt and uncle who have a sailboat because of a Mac, and put some pictures together in a slide show with music playing in the background from a roadtrip I went on. Those are only the tip of the iceberg that my little iMac is capable of doing, and doing quite willingly, thank you very much. Plus, with an iMac, I have such a greater range of creativity for design and layout. Not so much now that I don't have my shop, but on-line it is still easier to move things around, format, add backgrounds with an extra program . . . the list goes on. But when Steve said how he came to audit a class in calligraphy after he had dropped out of college, and how that was the spark that led him to design lots of fonts for his Apple, that revelation brought home again the knowledge that all designs start. Somewhere. With one person (or a collaboration, I suppose). There was a time when there were no fonts, when you could not choose how something would look: it was chosen for you. You had to answer to the technology; it did not answer to you. Apple has always been more intuitive and more responsive to its human counterpart. Without Apple, what would the PC have become instead? Then I heard that Anne McCaffery had died a couple of weeks ago. Wow. Her books were intense. I read the Dragonriders series when I was 16, and then in a heartbreaking turn of events, my finally-sober father gave them to me for my 17th birthday. I knew he was trying to reconnect with me, and he had spent time in a bookstore looking for just the right book that would please me. He found them, too. When I unwrapped them, of course he guessed that I had already read them, and I could just feel both our hearts breaking for the missed opportunity of "This is just the book I've always wanted to read!" He was gracious, of course, and I have my copy of the "Dune" trilogy instead. But the hurt was deep, the look on his face was still there, and I had such a hard time re-reading them; it was only about 5 years ago that I picked them up again. After all, what could be a greater tribute to Dad's thoughtfulness and reaching out than to pick up what he had handed me, all those years ago? It's what he wanted me to have and to enjoy, after all. And I fell in love with Pern all over again: its culture, its history, its First Fall legends, its harpers and riders and holders, and of course, its dragons. I re-read "Dragonflight" and "Dragonquest" and was touched by the story of Lissa and her struggles and about the moving through space and time. Then, at Dragon*Con, I picked up some of her books at a vendor, and happened to be reading one in one of the hotels when Todd McCaffery came over (recognizing the red cover, of course!) and said that he knew an author who would love to sign her work . . . ! *Gulp* How cool was that?! I saw the line for Anne McCaffery's autograph, though, and decided that no matter how much I loved her work, I could not bear yet another line. So perhaps I missed my chance to chat with an author, but her work has shown its strength of surviving for years. The Dragonriders series were books where women were strong characters in their own right, another fact that we readers of science fiction and fantasy take for granted these days, but were sorely lacking in the 60's and 70's. In fact, one of my other favorite authors, Patricia A. McKillip, deliberately wrote the second book in her trilogy, the book entitled "Heir of Sea and Fire," to begin to play with the idea of a female lead character, and what would her quest look like? Here, then, was another creative pioneer, one who not only got her books published during the male-dominated days of sci-fi, but made her main characters adult women and the men who respected them. The manipulation, the whining, the child-woman were all out the window with her. Plus, she created dragons! Then there's Ken Russell. I was into "Tommy" the movie in high school (as seen on HBO, of course!). Way, way into it. Its leading man was gorgeous with all of his thick, yellow curls and that magnificent strong voice of his, the way in which a newly freed Tommy reveled in his hearing and sight, and his attempt to show other people how to get from where he was to where he is, all showed a profound message. And again, the original rock opera was performed on stage: Ken Russell took that stage show, added the story of the husband and wife on their honeymoon, the shot of the plane zooming down in flames, the dasterdly-ness of Oliver Reed as Tommy's stepfather, all of those came from someone's imagination. There was a world and a time when these icons and shots did not exist, and now, thanks to Russell's creative genius, we live in a world where these things do exist. I've only seen "Tommy" once in the theaters: when I was a student in Paris and one of the movie theaters was showing it. I went with several musically-inclined friends, and right outside of the theater was a group of Hare Krishna's, dancing around and asking for donations. I thought THIS was the most honest and profound message of this movie/rock opera concept: the messiah-figure has a message, he finds followers, and what do these followers do? They become ridicule for jokes, or they bring down the messiah when he cannot bring the enlightenment that he has promised. I don't know if Pete Townsend had all this imagery in his mind when he wrote the music, but Ken Russell brought visual imagery to a piece of music that has existed on film long past the days when The Who performed it on stage. So while I haven't made as profound an impact on the world at large, I know that I have in many, many small ways done so by bringing, even for a short time, a place of beauty and creativity into being, and being a clearing house for threads and yarns and stories from all of my stitchers, all through the years, so that they had a place where they could create their tableaux, their hopes and dreams, and their surprises, too. My Fairy do so TOO have a head! She does - I finished stitching it a couple of weeks ago, and I'm right now filling in her gorgeous mane of brownish-red hair. But I haven't taken pictures of her head, because my camera and its "ooh-wow" effect is right now trained on my fairy herself. So there! She (Sidh?) is gorgeous. Simply amazing. On the cover of her pattern the picture shows her stitched on brown fabric. Not my taste - maybe it goes with her hair, but her gown on which I've worked for so many years just screams "Twilight Blue linen!" Oh, perhaps I should introduce my little fairy. She is the Fairy Flora in the line by Mirabilia Designs. She is one of the earliest designs in this line that came out in the late 1990's. Yes, I've had her since about 1997 or so, when Mrs. Dennis herself gave me the piece of fabric and the pattern, and said, "Here. I think she looks like you, and here you go." No preamble, no special occasion, just "here." Which for Mrs. Dennis, who survived the Depression and was not someone to give something away on a lark, was not like her. I've treasured this design and the gift of the fabric, and began working on it in probably 2001 or 2002, when I was feeling overwhelmed by all the great knitting out there. You see, as I've said in previous posts, I learned to stitch first. I can look at fabric, thread colors, and see how they can be changed, adapted, modified, and improved upon almost as easily as I can tie my shoes. I've helped customers over the years doing this, especially with these elaborate, years-long stitching designs, and I've found that changing a grounding fabric really brings out the design. Plus, I don't have the same vision in my head as the designer, so I can see how the design speaks to me (or a customer) and work within those parameters. So I think I started this pattern more out of a sense of knowing that there was truly "something" out there that I could do well, perhaps better than most, and that "something" was this glorious design, full of swoops and swirls and all manner of prettiness. And since I had the shop, I had the advantage of working on a lap board with double-ended needles and a Q-Snap frame. These tools gave me the knowledge of how to use them, how to sell them, and what the end product would look like. For years I had stitched in-hand, meaning holding the fabric in one hand and bringing the needle up and down with the other. All very well and good, and how I stitched most of my shop samples (since I wanted to get them done quickly), but this piece, ah, now this piece called for something more . . .
the stand set-up on which I worked on a quiet weekend morning. So what I would do is balance the stand on my lap (a wood-finished Baby Z-Stand by K's Creations) with the Universal Clamp to hold my Q-Snap. There are a lot of different fabric holders out there - hoops, top-and-bottom fabric holders that you roll the fabric, stitch the fabric, or velcro the fabric onto, and Kay realized this fact when she designed her extensive line of frames. I think I only sold one or two floor stands of hers, but her lap stands and stitching stools were extremely sturdy, attractive, well-built, and made with stitchers in mind. When I began stitching this piece, I realized how much more evenly my stitches fall into place (they don't have a slant on the top "x" that shows in which direction I am stitching - L to R or R to L). I also had the option, since I was using a lap stand, to use a laying tool. A laying tool is a handy little device, made of wood or even a metal fingertip cover (called a trolley needle) which you lay with your non-stitching hand on top of your fabric as you make each stitch to keep the tension on your threads even. I used one called the Practical Laying Tool (no longer in production, sadly) that has a square wooden handle (slightly chewed by Dave the Dog) with a large needlepoint needle embedded in the top. (For a superb explanation of the hows and whys of laying tools, I suggest this page from the Nordic Needle website.) For my part, I found that slowing down just a teensy bit to ensure that each stitch is even, not slanted, and the threads are not twisted (all thanks to the laying tool) has really made a difference in my finished project. In addition to a lap stand and laying tool, I also used a twin-pointed needle by John James. They came out in 2001 or 2002 at the Charlotte Needlework trade show, and again are only useable when you are not holding the hoop in one hand. What you do is, you lay one hand on top of your fabric, one on the bottom, and just stitch. The eye of the needle is in the center, the points are on the end (hence the name of Twin-Pointed Needle) and it allows your stitching to progress relatively easily without having to take one hand above and below the needle to make the stitch. It's a bit ambidextrous, but I was using the laying tool so I was learning ambidextrous stitching as I went. It also takes the strain off of your wrist, having to move it up then down as you stitch. And for a big project like this, a frame like this QSnap made all the difference in keeping the fabric out of the way and not all crumpled up and dirty as it would have if I had stitched it in-hand. Yes, there are wrinkles on it and even an indentation on the top photo that shows where the QSnap lay, but those will come out in the blocking. I've done it hundreds of times. Linen loves to wrinkle, and once it's wet and dried on a blocking board, it becomes just as straight and even as you would like. Those little spaces that form little swirls on her skirt? Ah, now those will one day be filled in with beads. Lots and lots of beads. THAT stitching I will have to do in-hand, since the QSnap frame literally snaps over your stitching, and if there is a bead in the way . . . you get the picture. Glass beads are enough of a "challenge" that I don't need to worry about little bits of beads in cracks on my floor or on my bare feet! I just had to take a picture of the contrast between the bright, vibrant flowers that lay over her gown (she's a fairy of flora, after all) and the light pinks and purples of her gown itself. As I began to stitch these clumps of non-gown symbols, I began to realize what an art it is to design counted cross stitch. Really. You could, of course, translate these forms and colors to paint, but where would be the joy in that endeavor? 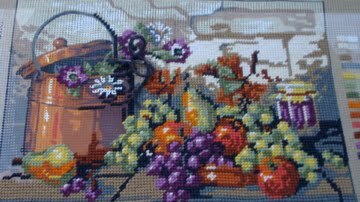 The texture, the colors that cross stitch has that are unique to it: any stitcher will be able to look at the purple and say "208, 209, 210, 211" and another stitcher will know exactly what they mean. There's just these shades, you know? It's more than "forest green," it's 3347 with a vine of 3371. The color 3371 is used for branches, dark highlights on trees, and backstitching. But you see it on these light peaches and purples, and it just draws your eye along the texture of the fabric. You see the detail because of these branches. And the gown just flows from one texture to another. between reddish-pink flowers, blue greens of forest, and blackberries. I've helped many customers pick out the threads, materials, and beads for their Mirabilia fairies, and I am so happy that I have one of my very, very, own to show off now. Head or no head! Again, here is another "in toto" shot. The extra fabric will be necessary for her raised wand and her wings. Which are stitched with blending filament, and are very, very large. *SIGH* She will be beautiful when it's all done, and you know, she's pretty darn amazing now.